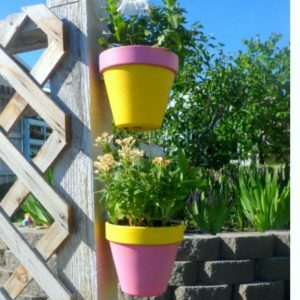 If you are looking for ways to add more visual appeal to your back yard, then consider decorating your garden or back yard fence with these easy DIY planters. You can hang one pot or an entire herb garden in just a few simple steps. They are clips that clip on to your flower pot, firmly holding it in place. Arrange pots singly or in groups. Purchase these Flower Pot Klips (12 Pack) from Amazon. They have a clip on them to firmly secure your pot. You can take your pot down or replace it with a new one at any time. 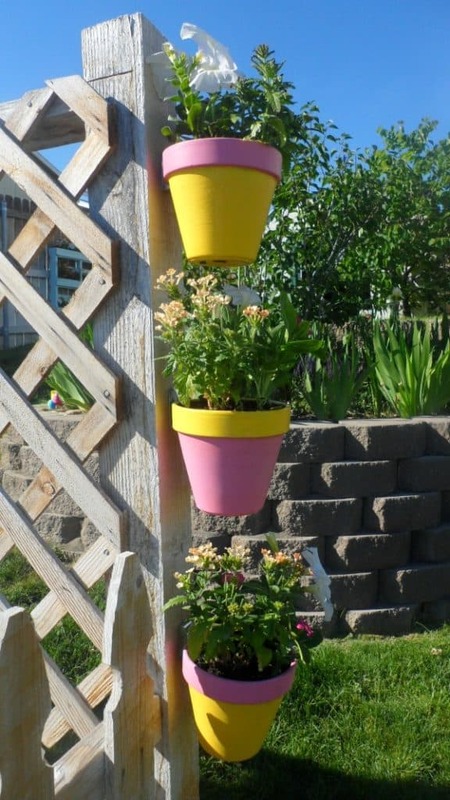 Hang several pots spaced out down the length of your fence, or group small pots together in one place. During hot weather, make sure the pots get enough water. You will probably have to water them at least once a day. If you can’t find a pot you like, just paint the pots the color of your choice. Find some outdoor paint in a color you like and paint some inexpensive terra cotta pots. Paint the base of the pot and the remainder of the pot different colors for a nice color contrast. This is another fun DIY project. To make a planter out of a paint can, just pick up a couple of empty paint cans at your local home improvement store. You can also recycle an old paint can. Using outdoor paint, paint the can the colors of your choice. Use stencils to write words on the cans, or use masking tape to create lines on the can or to use as a dividing line to paint the can more than one color. Use a drill to place several small holes in the bottom of the can for drainage. At your local home improvement store, you should be able to find a variety of hooks like this one that you can place on your fence to hang the paint can on. Use a drill to put the hook on the fence and then plant your favorite plants in your new planter. Another way to hang pots on a fence is by using a piece of lattice to hang the pots from. Cut a piece of lattice to the desired size (painting it first, if desired), and screw it to the fence. To create a DIY herb garden, buy some inexpensive lightwight plastic pots (make sure they have a “lip” at the top of them). Fill the pots with potting soil and add your herb plants. Use “s” hooks like these to hang the pots on the lattice. Hook one end of the “s” hook to the lip of the pot and the other end of the hook to the lattice. Depending on the size of your pot, you might want to use two “s” hooks per pot for added security. These planters are fun because you can move them around and change the look of them whenever you want. 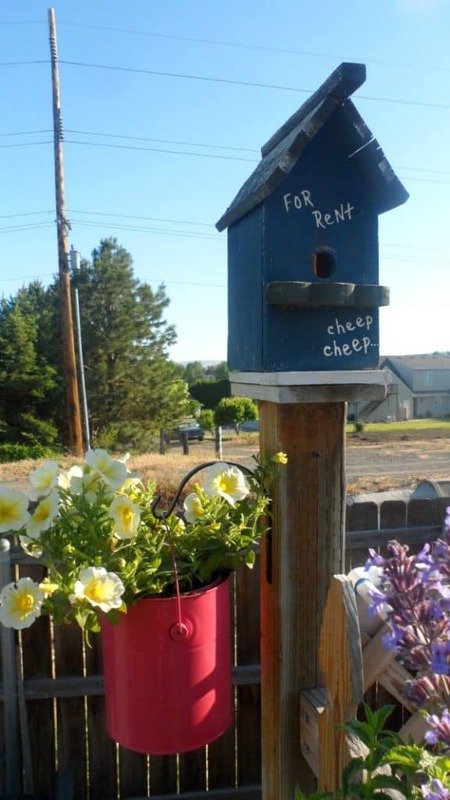 These pots will dry out quickly so make sure to water them daily during hot summer months. Don’t look at your fence as just a boundary between your yard and your neighbor’s yard. Look at it as an opportunity to free up space in your garden or on your patio, adding more color and interest to your yard.